There was a decline in beef exports in 2015-16, coinciding with first mob lynching over beef eating but they have recovered since. 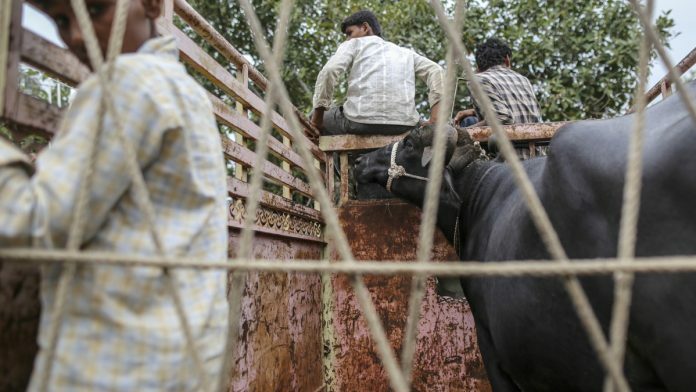 New Delhi: India’s beef exports increased, albeit marginally, in the last years of the Narendra Modi government – contrary to claims by a prominent global rights group that said data showed a fall on the back of attacks by cow vigilantes and tougher laws on cow protection. Beef exports from India – the world’s largest beef exporter – refer to buffalo meat alone as the slaughter and export of cow meat is prohibited. A Human Rights Watch (HRW) report, released in February, argued that vigilante attacks in India by cow protection groups coupled with tougher laws on cow protection had led to a decline in beef exports from India. Data with the Agricultural and Processed Food Products Export Development Authority (APEDA), which is under the commerce ministry, however, shows that when the Modi government took over in 2014, beef exports rose substantially. In fiscal 2014-15, beef exports stood at 14,75,540 metric tonnes — the highest in 10 years — up from 13,65,643 metric tonnes in 2013-14. The figure, however, slumped the following fiscal, when exports fell to 13,14,161 metric tonnes — a nearly 11 per cent drop. The sharp decline coincided with the very first of the mob lynchings over beef consumption. It was in September 2015 that Mohammad Akhlaq was killed by a mob on suspicion of cow slaughter at Bisara village in Dadri district of Uttar Pradesh. 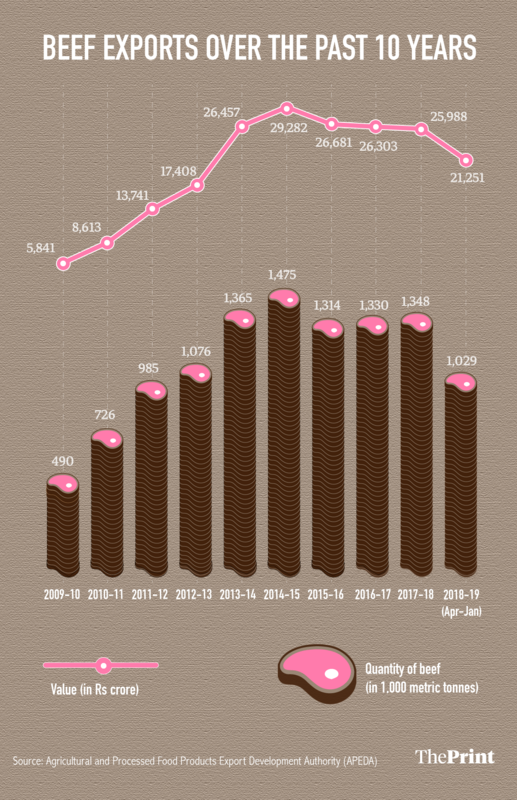 The next two financial years, however, witnessed beef exports rise marginally. In 2016-17, beef exports stood at 13,30,013 metric tonnes — a 1.2 per cent rise from 2015-16. And in 2017-18, the figure again marginally increased to 13,48,225 metric tonnes — a 1.3 per cent rise from 2016-17. The HRW report relied on data on the value of beef exports alone and not the quantity. As the APEDA data shows, even though the growth momentum in Indian beef exports pre-2014 could not be sustained, the export levels have broadly stabilised. There has, however, been a decline in the value of beef. For example, even though the quantity of beef exported increased from 13,30,013 metric tonnes in 2016-17 rose to 13,48,225 metric tonnes in 2017-18, the value of beef exports declined to Rs 25,988.45 crore from Rs 26,303.16 crore in the same period. While the increase in the quantity of exports and the parallel decline in value may be a result of variation in global prices, there is no definite correlation between the two, Ajay Sahai, director general and CEO of the Federation of Indian Export Organisations (FIEO) said. Some other sources of data suggest that both the value and quantity have increased over the last few years, he argued.